When World War II ended, soldiers came home to start families - and Mattel, a garage start-up founded in 1945, was eager to sell them toys. The company was successful almost from the start, featuring products like the ever-popular Burp Gun. It paid a small fortune in 1955 to become the sole sponsor of the Mickey Mouse Club, making it one of the first companies to market directly to children. Then in 1959 came one of those rare times when a business goes from good to great in something like an instant. It was, of course, the year of Barbie. 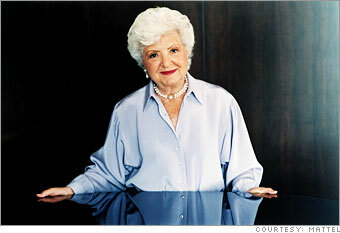 The doll was the creation of then-Executive Vice President and co-founder (with her husband, Elliot) Ruth Handler. Their daughter, she noticed, wasn't satisfied with paper dolls and wanted something more grown-up. Out of that insight Handler created a three-dimensional icon for the ages. An immediate hit, Barbie (who was named, appropriately, after her daughter) was not allowed to rest on her laurels. Handler introduced a line of Barbie friends, such as Ken (1961) and Skipper (1965), and created new brands like Chatty Cathy and See N' Say. Mattel went public in 1960; in the following years, it took Barbie global and became one of the Fortune 500. Named president in 1967, Handler continued to drive the company's growth with the development of Hot Wheels and playground sets. Breast cancer (1970), eviction from office (1975) and federal charges of preparing false financial statements (1978: she pleaded no contest) made for a difficult decade, but Handler kept going. Her mastectomy motivated her to start Ruthton Corp. a prosthetic breast company bought by Kimberly-Clark in 1991. By the time she died in 2002, more than a billion Barbie dolls had been sold and Mattel was the world's largest toymaker.